During his years with the Historic Resources Branch, David Butterfield inspired our committee with his enthusiasm for local heritage and his own research on topics ranging from Manitoba cemeteries to former industries. Now "retired", he is proof that architectural historians never retire, they just build on their past. David has just completed a study of one local industry, the Leary Brick Works. His earlier studies of brick-making in Manitoba provide a context for exploring the history and working of the plant. This latest report is based on several trips to the current site where he took careful measurements of every detail of the deteriorating buildings and machinery. 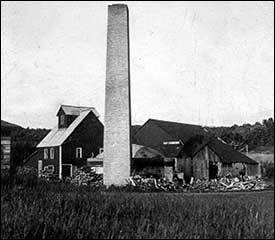 The old brick plant is located on the banks of the South Boyne River on land purchased from the CPR in 1900 by early entrepreneur George Leary. The plant operated under various partnerships as Boyne Valley Brick Works (1901–5), Dominion Press Brick Co. (1905–1910 with R.P.R. Roblin as a partner), then as Leary Brick Works until its closure in 1953. Although sales records have been lost, there is some anecdotal evidence of the industry’s imprint on Carman/Dufferin. Renovations often reveal Leary bricks in local walls or chimneys. The first Albert School, the fireplaces in what is now Breakaways Restaurant and the former Sommerville home are among these structures. Notably, the last house built of Leary bricks (1950) was the "Harris House" in Carman. 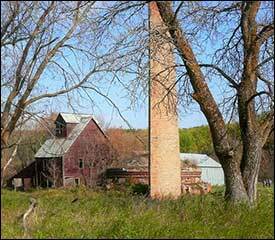 The deteriorating Leary Brick Works is the last semi-intact remnant of some 200 brick plants that once operated in Manitoba. Based on extensive research, David Butterfield has woven together a perceptive story of this one small industry, placing it within the backdrop of local history, politics and economic development. The real strength of the report lies is in the many fine architectural drawings that trace every step of the brick-making operation from shale on the bank of a stream to the bricks that are still part of many of our most durable heritage structures. The heritage community hopes that David Butterfield continues to enjoy such a productive "retirement". For a slide show of Leary's plant over the years, click here (1.1 MB pdf) .